Kevin and his brother Rob, shot some video at Bartlett Wash from his recent trip to Moab. Well this is week 2 in Boston and today we finally got to see not one, not two but 9 rats in Boston Common. This is not your typical bike story, although we have seen some real relic bikes, a lot of folding bikes, a ton of rusty junkers, and one or two really nice bikes that looked out of place. Our adventure started in Cambridge at a bed and breakfast because all the hotels in downtown Boston were booked up the first week of October. Our rooms were on the 3rd floor and every time I climbed the stairs I was breathing as if I’d done a sprint. 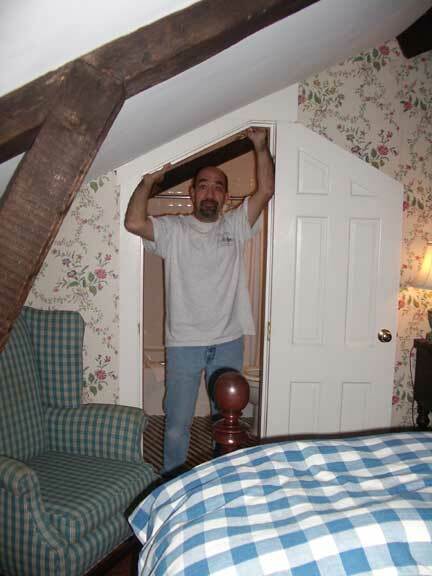 It was a little like Alice in Wonderland with the sloped ceilings and low roof but the rooms were comfortable and John especially liked the ruffles and Victorian touches! 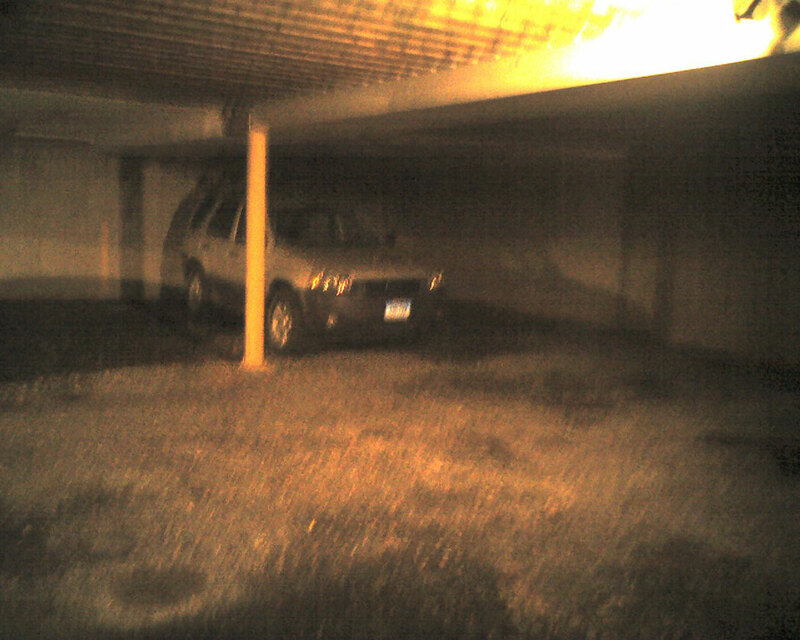 John was also crazy about the parking dungeon, I mean garage (see picture). Actually it seemed pretty safe but a little tricky to park (I backed into the wall on my first attempt to park not realizing the wall curved). The best part was the breakfast served every morning before we trekked in to Beacon street for our class. We are now experts at taking the T after making numerous mistakes and getting squeezed and squashed like sardines. Our routine consisted of taking the T from Porter Square to Kendall and walking the last 1.5 miles to class then hoofing the 4 miles back to Cambridge after class. We brought our bikes but after seeing the traffic conditions they stayed in our room the whole time and we tried to walk everywhere. I’m guessing we walked at least 6 miles a day and by Thursday we were experiencing some serious leg and foot aches. Did I mention the double stabbing in the Park Street T Terminal (our stop for the class) the first evening we were there? Did our obsessive compulsion to exercise prompt us to walk or the thought of the incident on the T. Hmmmm, maybe a little of both. Last week we adventured through the combat zone to Chinatown to eat at a restaurant that was recommended by a girl I talked to on the T. Check out the picture. The restaurant seats about 700 and there were only 6 people there that night. Apparently the weekend packed in about 2000 patrons that all come to eat the Dim Sum but they do not serve it on weeknights. That’s ok, neither one of us are adventurous eaters and nothing is labeled on the carts and it’s hard to tell what you are actually getting so Dim Sum would have been lost on us. The adventure was getting there, we weren’t too adventurous with the dinner. I ordered chicken with broccoli and John ordered beef with broccoli. Although John did get wonton soup which is usually made with pork but had shrimp in it which he was allergic to and couldn’t eat. The food in Boston sure beats my regular fare of lean pockets and oatmeal although we are not gaining any weight so far – probably because of all the walking. This week we’ve ventured twice to the North End and will probably head back there at least one more time. The Italian food and pastries there are incredible. After dinner tonight we went to an ice cream injectible bakery and had a cupcake injected with ice cream and covered in chocolate sauce. John was smart enough to eat it with a spoon but I was not and had chocolate in my hair, my face and all over my hands but it was the most incredible tasting dessert. We questioned the Italian authenticity of it but decided it was so good we didn’t care about the origin. Did I mention the rules on the trip? No chain restaurants and we can’t go to the same restaurant twice. We’re doing pretty good so far and I won’t mention the D&D coffee John had on Monday…He said it wasn’t his fault, his wife got it. Hmmmm, I think that’s good for at least one Starbucks trip for me! So tonight the big excitement was seeing the rats in Boston Common. The other guys in the class had been talking about the rats in the park all week and we didn’t believe them. Of course every night John wants to go to the park to see and I’ve been resistant but we decided to walk back to the hotel (we’re in downtown this week, at Copley Square) and cut through the park. Halfway through we didn’t see any rats despite our obsessive viewing of the area and figured the guys were pulling our leg. Then I spied the first one, John didn’t believe me then 3 more came out. Of course the camera came out and they all scattered so we found a better spot and finally got our golden picture of two beady eyed rats. Needless to say we were pretty proud of ourselves. John actually clicked the winning shot with my camera, my pics were all black. Then we ran screaming from the park. This is a great ride for a great cause. Connecticut Tour Des Farms helps to support agriculture and farmland preservation throughout our state. My family owns the last farm in operation in Vernon and my college roommate is a dairy farmer in North Stonington so the plight of Connecticut agriculture hits home to say the very least. Local food is fresher. It is also better for our local economy and environment. If you aren’t buying local, you just aren’t thinking! This Tour Des Farmes took me through Glastonbury’s farms. I had not realized there was so much local food available at good prices right around the corner from where I work! My first stop was at Dondero Orchards where I bought two dozen eggs. How could I carry those on a racing bike? No problem because the volunteers transport any bought produce back to the start point for pick-up at the end of the tour! Its a good thing too because from there I headed up Clark Hill Road to get a panoramic view of the Connecticut Valley. The weather was clear and what I could see was worth every foot I climbed. The numerous other stops included Belltown Hill Orchards where I bought a bushell of red bartlett pears for $10 (???!!!!) and Rose’s Berry Farm. Rose’s has wonderful raspberries. I picked an entire flat before heading out past Old Maid’s Organic Farm to ride along the Connecticut River. My only regret of the day was that I had not brought more money. One of the last stops was at Robb’s Ice Cream and I had no money left : ( The $5 in farm vouchers was used up miles ago on those eggs. No matter, I’ll have a great excuse to wander out that way again soon! Thanks Nerac for suporting such a great event!